The Best Buddies Jobs program integrates skilled and qualified individuals with intellectual and developmental disabilities (IDD) into the community through supported employment opportunities. Individuals with IDD who participate in the program are paired with businesses who are searching for enthusiastic and dedicated employees that have their skill set, thus allowing them to earn an income, pay taxes, and work in an environment alongside others in the community. 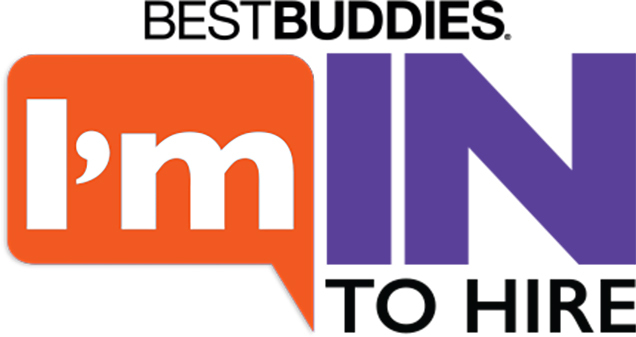 Businesses that partner with Best Buddies to place candidates in competitive, integrated jobs within their organization receive the ongoing support and training needed to foster a positive employment experience. Project SEARCH – A High School Transition Program that is a unique, business-led, one year school-to-work program that takes place entirely at the workplace. Association of People Supporting Employment First (APSE) – Through advocacy and education, APSE advances employment and self-sufficiency for all people with disabilities. Vocational Rehabilitation Agency – A listing of every state’s Vocational Rehabilitation Agency, which can assist individuals with disabilities to prepare for, obtain, maintain, or regain employment. National Association of States Directors of Developmental Disabilities Services (NASDDDS) – A portal to find your state’s Intellectual/Developmental Disabilities (I/DD) Agency, which offer appropriate services oriented toward the goal of integration into the community. Job Accommodation Network (JAN) – A source of free, expert, and confidential guidance on workplace accommodations and disability employment issues. Administration For Community Living – An organization created by the U.S. Department of Health and Human Services to maximize the independence, well-being, and health of people with disabilities across the lifespan, and their families and caregivers. Adopt diversity and inclusion (D&I) as an organizational strategy and articulate D&I strategies within talent acquisition and talent development initiatives. This recognizes D&I as a critical component of how the organization will accomplish its objectives and aligns D&I goals with pre- and post-hire talent practices. Engage and involve leaders, managers and workers who will advocate for individuals with IDD by creating a cross-functional task force that brings together HR, customer service, legal and other key functions. Invite employees who are personally passionate about providing employment opportunities to individuals with IDD and ensure top-down participation in creating IDD-friendly policies and practices. Become better informed. Research the resources that are available and connect with local providers or regional chapters of national providers to learn about services available. Develop a menu of resources that can help jumpstart this employment initiative and set expectations for the firm and its employees. Open the door to job customization and other creative solutions that can have an impact on productivity and the bottom line by identifying relevant job opportunities. Invite a professional job coach to observe work processes and interview employees to learn about jobs, tasks and the work environment. Leverage learning to fully integrate employees with IDD and address challenges. Provide supervisors with training on how to integrate workers with IDD into the fold, with orientation, work instructions, performance and behavior guidelines, and recognition and rewards, just like all employees. Promote a culture of inclusion that attracts diverse talent and creates a positive image in the community. Encourage inclusive behavior throughout the firm, truly integrating workers with IDD into the workforce. Treat workers with IDD as employees first, not as disabled employees. Celebrate successes. Share IDD employment success stories widely, within the firm, the industry and the community.